With dozens of types, designs, and sizes to choose from, selecting the best tiles for your bathroom can be quite a dilemma. Since the tiles set the tone for the overall look and feel of your bathroom and are usually the first things anyone entering this room will notice, it is crucial that you select the right type. If you are still planning your bathroom renovation project, make sure you think carefully about your budget for the tiles. Since bathroom tiles also come at different prices, your budget will help you narrow down your possible choices. In case you can’t allocate a lot of money to your tiles, you may have to go with ceramic and porcelain since they are the least expensive options. Both materials are also water-resistant, durable and long-lasting. Most bathrooms have two different tiles: one for the floor and one for the walls. However, many homeowners want to have more tiles in this room to make it look more interesting. If you also want to add more color and texture to your bathroom by having more tiles, don’t go beyond three types or designs. Pick a floor tile, a wall tile for the shower or bathtub surround or for all the walls, and an accent tile that will be used as the focal point in the middle of the room. When choosing your tiles, put some thought into your first, must-have tile. This “dream” tile will be the starting point or basis of the floor design and your choice of color palette. Coming up with a color palette for your tiles can be difficult. If you already picked your cabinet and vanity colors, you can use them as your starting point for building a palette for your tiles. If you haven’t decided on your cabinet and vanity colors yet, it would be best to start with a neutral palette. Next, find one tile that you really love and build around that. Once you have picked this tile, you will have an easier time deciding on the complementary pieces. In case you choose a white or beige tile for the floor or walls, make sure you add an element of interest. You can do this by adding a colorful accent tile or smaller white penny tiles to make the floor or wall more interesting. Smooth, glazed tiles are easier to clean. However, they can be slipping hazards especially if placed on the shower floor. Because of this, it is always best to select slightly textured tiles for the floor and a smoother one for the walls. However, be careful about choosing textured tiles as well. This is because water tends to settle on heavily embossed tiles and tiles with pebbles, dips, and crevices. If you pick this type of tile, be ready to put in more time cleaning and maintaining them. Your tiles should complement the size of the bathroom. As such, if you have a medium-sized bathroom, medium sized tiles are your best options. 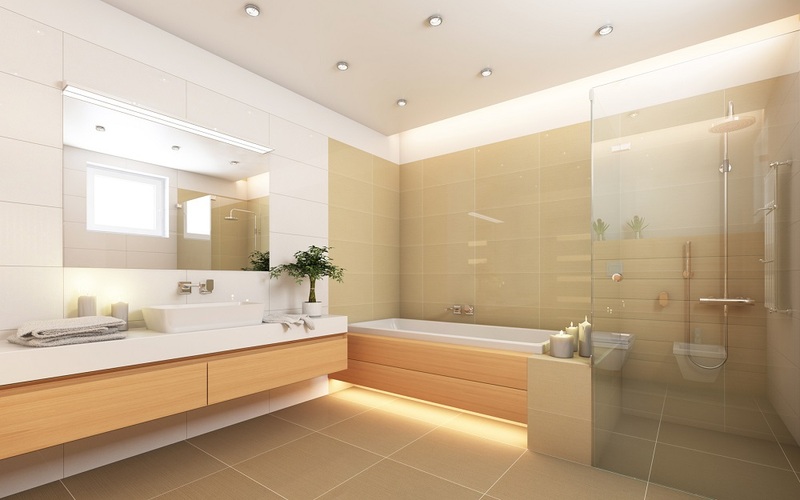 But if you want your bathroom to have a floor that looks like it has one continuous surface, you can get larger tiles. This is because when large tiles are installed, they have fewer grout lines and, as such, give the floor an unbroken, straight appearance. If you’re stuck between selecting large tiles or ones that complement the size of the room, consider your lifestyle and how much time you are willing to put in cleaning and maintaining them. Keep in mind that the more tiles you have, the more crevices you will have to clean regularly. Lastly, aside from frequently cleaning the tiles, certain types require some regular maintenance. So in deciding on the material, take into consideration the amount of time you can devote to maintenance as well. Tiles made of natural stone, for instance, have to be sealed regularly. They tend to hold on to dirt and grime so they require regular deep cleaning and special solutions to remove foreign substances. If you really want to add texture with stone, make sure you place these tiles in an area in the bathroom that doesn’t get wet frequently. If you have any trouble making a decision regarding the tilework, your builder or contractor can also help you choose the right tiles that will work best for your bathroom and budget, and even complement the overall design of your home.